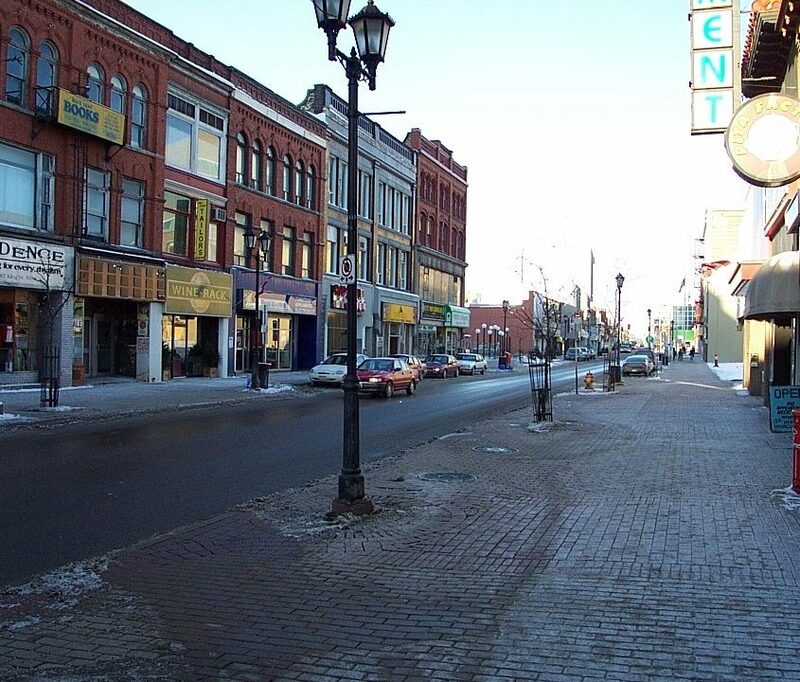 Kitchener is a city in the Regional Municipality of Waterloo, Ontario. It is located west of Toronto, and it is a “twin city” with Waterloo. The City of Kitchener Integrated Transportation Master Plan: Transportation’s Role in a Complete and Healthy Kitchener (June 2013) makes frequent reference to Complete Streets, while also stressing the need for a standalone Complete Streets policy. A Complete Streets approach accommodating all modes and users is an integral part of the active transportation section of the TMP (p. 1). The plan places considerable emphasis on building a Complete Streets network to facilitate cycling and walking in Kitchener (p. 63). In the City of Kitchener’s Official Plan: A Complete & Healthy Kitchener (approved by the Region of Waterloo on November 19, 2014), a Complete Streets policy is included within the Parks Strategic Plan and Leisure Facilities Master Plan: “The City will develop a system of Complete Streets, linked open spaces, multi-use pathways and bikeways throughout the city relying heavily on the city’s parklands, watercourses, utility corridors, natural heritage areas and schools” (8-C.1.12). 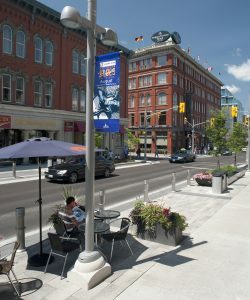 King Street in Kitchener, Ontario was one of nine Complete Streets projects profiled in TCAT’s Complete Streets Transformations. An innovative redesign featuring seasonal flexibility, enhanced pedestrian features, and sustainable streetscaping has substantially improved this downtown main street in Kitchener. This transformation won a Community Places design award from the International Making Cities Livable Council for bringing people back to the downtown. It cost $14 million and took 4 years to complete (2006-2010), from the beginning of the design process to the end of construction. 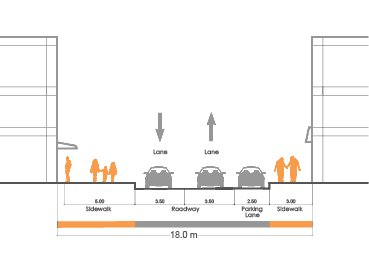 Sloped curbs to improve universal accessibility. New bike racks to encourage cycling to nearby destinations. Environmentally friendly planter beds that collect and filter stormwater. 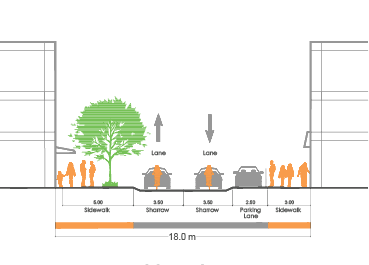 The addition of 120 street trees to enhance the human scale and provide shade. Increased amount of seating to create spaces for people to linger. Signature lighting to enhance safety at night. Removable bollards to delineate on-street parking spaces in the winter and to close off the street for public events in the summer. The perception of safety along the street is positive. According to a survey conducted after the completion of the project, 92% of people on King St feel safe during the day. Although no data is available from before the street redesign for comparison, this news is positive for a downtown that previously struggled with safety concerns. Festival attendance has risen from 250,000 to 400,000 per year. Pedestrian activity has increased from an average of 3,000 pedestrians per day to 8,900 pedestrians per day on average, an increase of nearly 200%. Fifty-nine façade improvements have been undertaken since the project’s completion, indicating a benefit to local businesses. The number of summer patios has increased from 5 to 16.